(Hilo) – During a regularly scheduled quarterly aerial assessment of forests on Hawai‘i island in late July, spotters detected more trees “symptomatic” for the presence of C. lukuohia, the fungus more commonly known as Rapid ʻŌhiʻa Death. 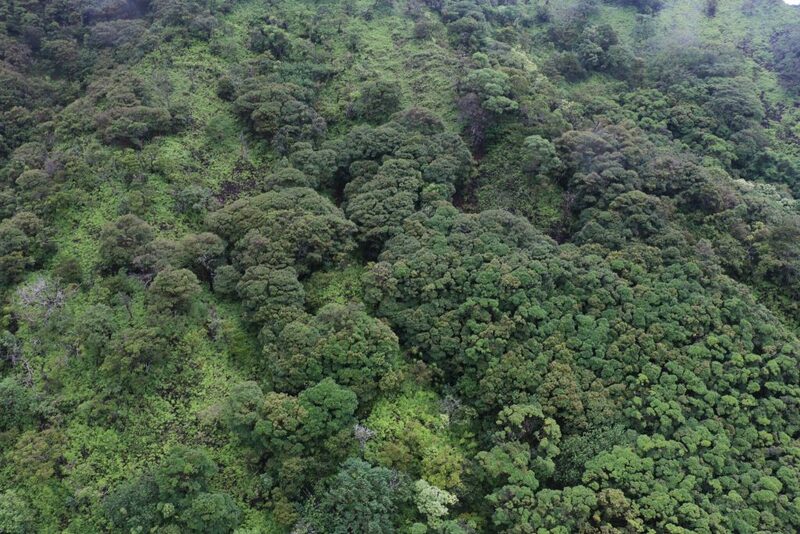 These trees are in the Kalōpā State Recreation Area on the Hamakua Coast and after the helicopter surveys utilizing digital mobile sketch mapping (DMSM), ground crews from the Big Island Invasive Species Committee (BIISC) followed up by taking ground samples. Bill Buckley of BIISC said, “This detection is roughly 12 miles from the nearest known occurrence of the fungus on the east side of the island. We sampled three trees in the recreation area and three trees in the adjacent forest reserve.” Five of the six samples tested positive for C. lukuohia, one of a pair of fungi associated with Rapid ʻŌhiʻa Death and the most aggressive of the two. Tree felling only happens if it can be done safely and without harming surrounding trees. It’s ideally done on a rainy day to limit potential airborne dispersal of the fungus. Felling would only happen in the park and not in the adjacent forest reserve, where the tree canopy is too tight to make cutting trees a viable option. Kalōpā State Recreation Area has been closed since mid-July for repairs and upgrades to the park’s cabins and campgrounds. The projects are not expected to be completed until May 2019. Discussions are underway with an adjacent private landowner to gain access to sample symptomatic trees on that property as well. Based on on-going aerial surveys, it’s estimated 135,000 acres of ʻōhiʻa forest on Hawai‘i island currently show symptoms of the disease. Earlier this year the less aggressive strain of the fungus was detected in a relatively small stand of trees on Kaua‘i. So far it has not been discovered on Maui or on O‘ahu, but regular surveys continue statewide.